​I have got a huge amount of catching up to do on this blog. It’s been slightly manic here, with various things, and I haven’t had much time to update the website, or blog at all. First of all, let me tell you the most exciting news. After all the work, trips to London for photoshoots, all the beading, stiff shoulders, pricked thumbs, unpicking, starting again, finally the book is complete. At the end of August I received a rather large package, too big for a book, but it was the final proofs of every page, all the photos, all the diagrams, all my writing, in its final form for me to proof-read one more time, and check over. I could have cried at what they did with the final product shots. I wasn’t around for those, I left them with the publisher to shoot in their own time, so I had no idea how those shots would turn out. Finally, in my hands, my author copy of my own book. Finally, I had achieved a lifetime’s dream, to write a book. Yes I already have an indie published book, and that was so exciting to have done, but in reality it is just a compilation of already published tutorials that I decided to put into book form, and it did well, I’m pleased. But to have worked with an actual publishing company, having a book published under such a well-known imprint such as Kalmbach, with professional photography and layout and editing, to have the marketing taken care of. That is something else! I was grinning from ear to ear all day. I wish I could show off the photos but the actual book is still under pre-order, though I’m told, doing really well, Kalmbach are pleased, which is a good omen for the next book under negotiation with them. Yes there may be another, we’ve been working on it this year, though for now it’s out of my hands. You can get the feel of the book from these photos. It seems that Beadwork magazine forgot to include the colours I used for the purple Flamenco bracelet, and judging by the number of emails I'm getting, it's a popular colour. So here are the bead colours I used. This is the second bracelet in my introduction to RounDuo beads. I called it this because of the shape, like waves, and the sparkle from the crystal bicones resembling the flickering specs of like on moving water. And of course, because the first one I made is blue/green. This one again only uses RounDuos, seed beads and bicones. This time, because the shaping is a little more defined and delicate, I’ve used size 15/0 seed beads. 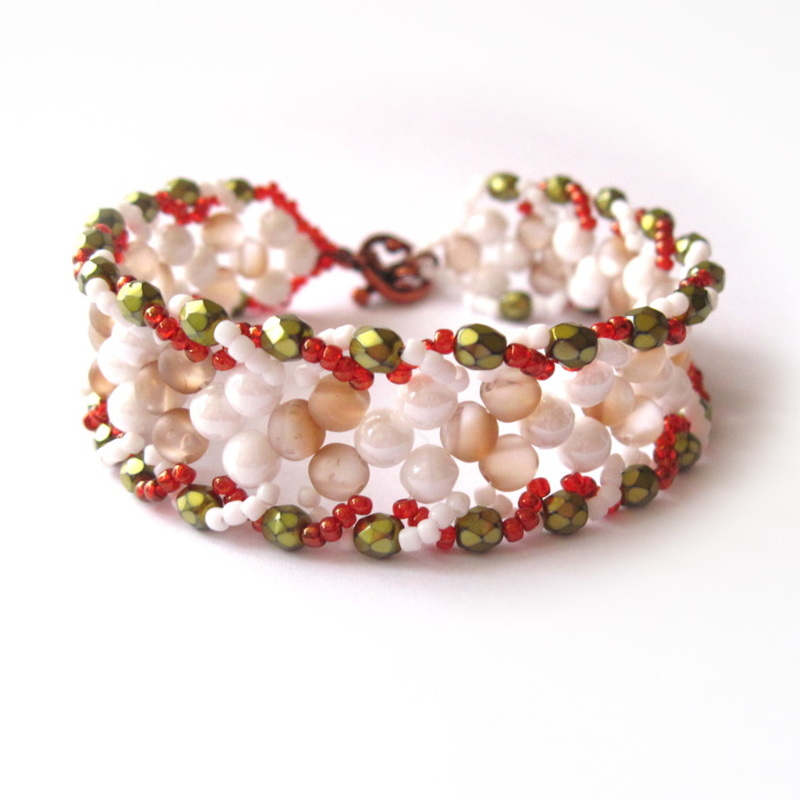 We have a foundation row of groups of four RounDuos, then a second layer of RounDuos, bicones and a cross-over of seed beads, making a beautifully shaped and textured bracelet. Again, the tutorial for this bracelet can be purchased here, or in my Etsy Shop. Now that my book is all but finished, just one more photo shoot this month, I thought it was about time I caught up on a few things. While I wasn’t looking, a plethora of new two-holed beads crept into my supplier’s shop. It was high time I started playing with these and designing some fabulous new pieces. So here we are. I have begun by experimenting with RounDuo beads. These are simply divine little round beads with two parallel holes, and will work really well with other two-holed beads. There will be new designs mixing these with SuperDuos as soon as I can get them written up, but for now, as an introduction, I made this Chevron Bracelet. I aimed at taking on the shape and characteristics of a typical flat spiral, but a single row of RounDuos in the middle was simply not working, so I made it with three rows, put together with a modified Right Angle Weave, and the loops of seed beads and crystals along the edge added in a simple back stitch. I think using two colours works really well with this design, the results are very pleasing. 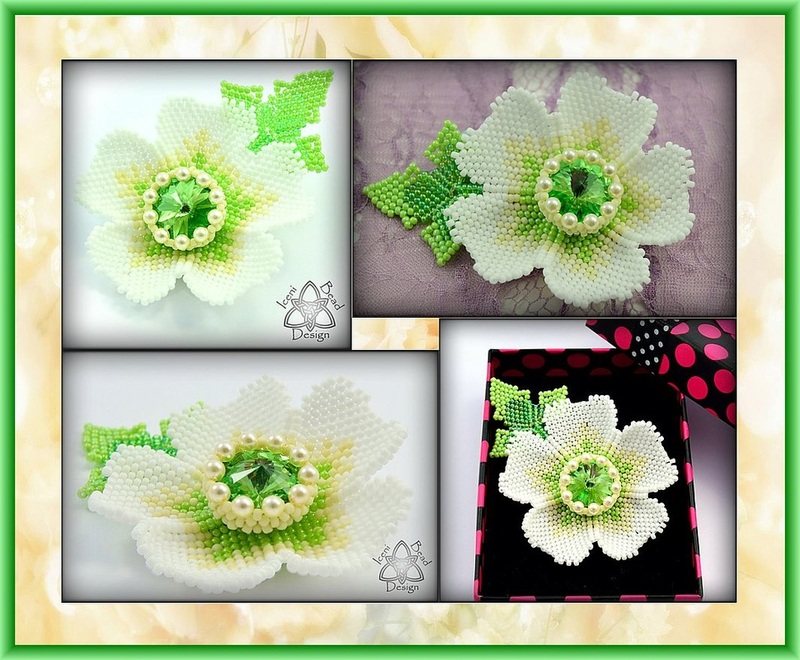 When I first made my Anemone Brooch, I showed it on my Facebook page, and along with a lot of oo’s and ah’s, several people commented that they would be interested in purchasing one. I said I still had a lot to do on the book but there will be some ready around mid-February. This was done, as I worked throughout January to make a good selection so nobody would be left out, and decided to charge £25 each for them plus postage. Guess what? Not one sold. I think people thought they would be a much lower price. This is sad really, because it does nothing to help the artist making items, to have to sell them dirt cheap and make nothing. Many of us try to make a living doing this, which means we need to pay ourselves a wage, cover our costs, and our overheads, like electricity, heating, water, rent, local taxes. One single flower takes about 9 hours to make. If I paid myself the minimum wage, £7 per hour, that makes £63. The cost of the materials was around £10. Any business will then add a margin for profit (which will be taxed), of say 30%. That makes a total of £98. Factories can make these much, much cheaper. They can churn out dozens, if not hundreds, every hour, by machine. There will not be the personal touch, they will use the cheapest materials possible, there will not be the calloused little finger from pulling threads many times per hour, there will not be the pricked fingers when the needle slips, the tired eyes while you ‘just finish this bit’, the late dinners, abandoned housework. Factories could probably produce these for mere pence each, buying their materials in huge bulk wholesale, but they will also not be made to last, they will not be a legacy of craft, they will break, because they want you to buy another, and another. So think about it next time you see a handmade item for price it is. Is the price really high, or is it actually very low for what it is. Chances are, like me, the crafter is underselling her product, selling it cheaply with no profit because people don’t want to spend money on quality craftsmanship, or are too eager to compare them to high street tat. I should be selling these brooches for a minimum of £100 each, not a mere £25. You know what? I decided against showing you my progress with the new camera, I really don’t want to bore you all with the details and loads of photos. Suffice to say that with practise, my photography is coming along nicely. However I will be showing the things that inspire me from time to time. Take for instance, these gorgeous Anemone Flowers. I love their vibrant colours and big bold centres. I always imagined a gorgeous rivoli centre, and having made a netted bezel with pearls and size 11/0 seed beads before, I had to work out how to add it to the flower itself. My first flower was made using brick stitch. It worked really well but took so long, so I turned the pattern sideways and made the next one with peyote stitch. That was much easier, faster and more effective. My only mistake on the second one, at least on the first couple of petals, was making a figure-of-eight turn at the end of the row, while decreasing too. I had forgotten about catching the thread inside and turning around that. So now I was away. But how to fix that bezel on it? So I tried a 14mm rivoli and netted bezel. It was so awkward sewing on the back of the bezel AND the inside of the flower, there had to be another way. Once it was done I then realised the rivoli was too small. Out came the 18mm rivolis. So the second flower had to be completed differently. I knew I’d need 10 pearls around the 18mm rivoli, and there were 5 petals, with two open beads on each point, giving me a 10 bead starting point. What if I made the bezel in complete reverse? That’s what I did, and by golly it worked! Here is the result. Of course I couldn’t just leave it there. Anemone’s come in so many colours, and after showing off the purple one on Facebook, which generated some interest in purchasing, I made more. White, red, blue, rose, coral and lavender. Then came the leaves. Anemone leaves are delicate and segmented. How to achieve that shape? Well of course I’m not that good, but I was good enough to invent a three part leaf, with a ladder stitch stem that was sewn directly to the join between petals, inspired by one of Huib Petersen’s leaves. So we had a stack of gorgeous Beaded Anemone brooches. The pattern will be written and published soon. Meanwhile, the brooches themselves are on sale on my Facebook page. If you would like one, or would like me to make one, please do inbox me from there, or using the contact form here. 'So here we are again, at the start of another new year, and what a year it’s going to be. To begin with, my book will be released this year, in September. I am still working hard on it, and was making the journey from Norwich to London in early December for photo shoots. The book is going to be photo-based instruction rather than diagrams, though I have made some diagrams for some of the more tricky parts that are not so obvious in the photos. I’d love to show you some of the projects before release, but my hands are tied. However, I have taken my own photos of the pieces to show later. I have a couple more photo shoots to attend, making each project stage by stage. It’s slow going and tiring after a two-hour journey each way, but I’m loving it. I did take a break over Christmas though, and prepared some more designs separate from the book. I will be writing up a tutorial for this gorgeous Anemone brooch, or pendant, or hairpiece, whatever you want it to be. I have always wanted to use rivolis as a centre for a beaded anemone flower, and almost achieved it with my Anemone Pendant made with SuperDuos. Now however, I’m using size 11 seed beads in peyote or brick stitch, with a netted bezel and pearls to capture the rivoli, and I have to say I’m thrilled with the result. Sadly (in a way) I have to get back to the book this month, so this has had to be shelved for a while, but as soon as I can get working on it again I will, for possible release in late February/early March. I also need to write up a tutorial for the Christmas star, but that will not be released until late summer. I have other plans for this year too. I self-published ‘Beautiful Jewellery with SuperDuo Beads' in 2014, and I have enough to produce another collection of my tutorials. But it takes a while to format everything into book form, proof and publish, and I can’t work on that until I have finished the Kalmbach book. 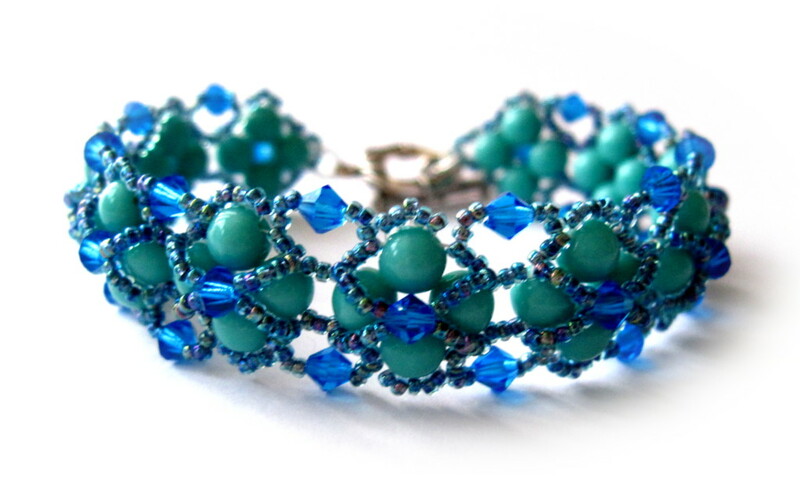 There will also be a fabulous bracelet published in the June Issue of Beadwork magazine, using SuperDuos and the new Hubble stitch. Light, lacy and feathery it’s a stunner! The tutorial for that will follow with ‘As seen in…’ How about that? More to follow, and once the Kalmbach book is finished, I will be able to update this blog a little more often, at least until its release. Well here we are, Christmas Eve, all the baking is done, presents wrapped, food shopping done and vegetables prepared for the big day. My living room looks like Santa's grotto, and the house smells of spice and oranges. Part of my preparations was to make some new ornaments for the tree, which I have done while taking a short break from the book. I had some designs running through my head driving me mad, and with this break, I've been able to work them out and get them going. The first is the Solstice ornament. I originally made this in brick stitch, but it was easier in peyote. However I've written the tutorial to show both stitches, so you can choose your preference. I love the open design of this, which, if caught right, allows the lights to shine right through it. Lovely! Next is the peyote/brick stitch 3D star. There are a lot of these available online, so I wasn't sure if I should write the pattern, but to get the beaded design across I will have to. This is a last-minute make though so I haven't had the time to write it all up yet, and so far only one is complete. The second, a green one, has about an hour of work left on it. In the meantime, I'd like to wish you a Very Merry Christmas, eat, drink and be merry, and in the New Year I should be able to update this blog more often. ​This pendant was originally designed as part of a lariat necklace for the book, as the final ‘finish with a flourish’ project, using little bits from previous projects to create a whole new piece. However, the project ended up just too large. I reduced it to just the pendant, but we already had enough pendants in the book, so the final project was completely re-designed and this pendant was side-lined. However, it’s just too pretty not to use, so I’ve re-written it as a pendant tutorial instead and here it is, ‘Revelation’. So called because with the petals seeming to unfold around the central rivoli, it appear to be revealing the crystal. The use of contrasting colours emphasises the shape and texture even more. ​It’s not as complicated as it looks. A simple netted bezel, similar to the one I did around the Faith pendant, then a modified Peyote stitch to put the petals together. The hardest part was probably weaving back through the petals to the centre. I tend to pull really tight, which makes it difficult to weave back, as the needle doesn’t always want to go through the bead without the assistance of my pliers. I just takes a little more ‘wiggling’. I think the results are gorgeous, don’t you?